2015 Update. After the strange killing of toads last year we were pleased to note that a breeding population of toads did return in Spring 2015. The numbers were somewhat reduced from previous years but spawning did take place. No dead toads were found anywhere around the pond. 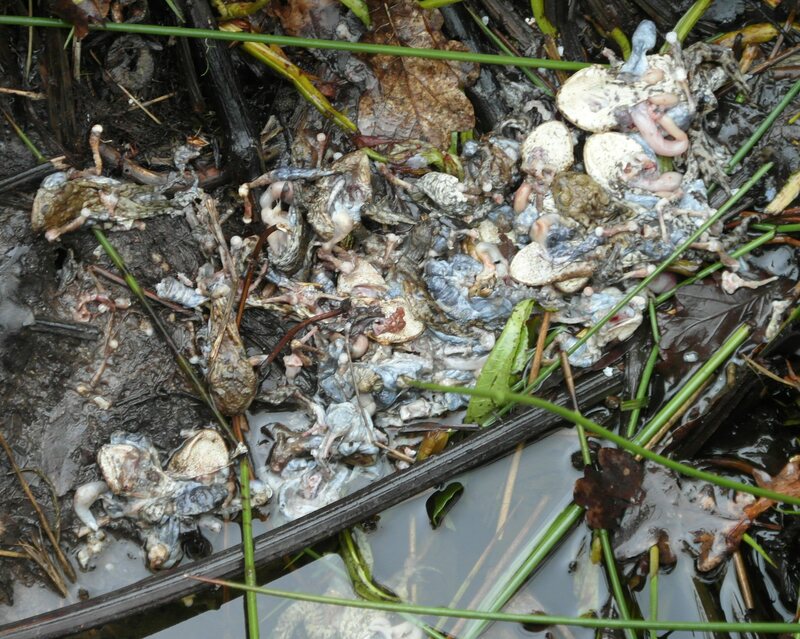 Toad Carnage In early March 2014 piles of dead toads began appearing around Woodslea Pond. This is the time of year that toads migrate back to their ‘home’ ponds for spawning and are relatively abundant and easily seen in and around the waters edge. 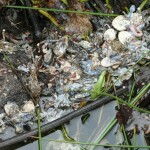 The piles of dead toads were located in the front corners of the fishing pegs, sometimes with a pile at each corner in a single peg. They were never scattered around. 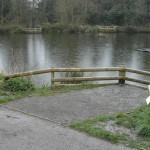 There was also one smaller group of bodies located in the waters edge just next to the peg shown in the photo. A small pile of bodies can also be seen at the front corner, despite the fact that a pile of bodies had been previously removed. 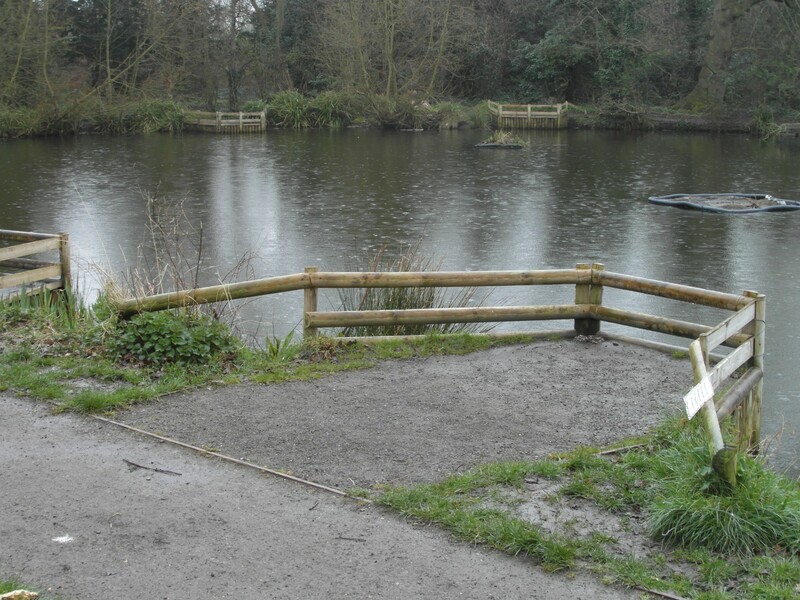 Initially we were unsure as to what was causing the deaths, ideas included herons, humans (perhaps with some misguided idea about toads and fishing? ), cats or buzzards (we have a resident family in the reserve). 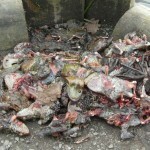 More dead toads were appearing every day , always in the piles locations. Advice was sought from wildlife knowledgeable authorities and local wildlife experts. The answer came back otters or mink! We examined the piles of bodies and looked at the injuries. All had clearly been killed with a degree of force , enough to rupture the body contents, cuts to the skin and mutilation. Closer examination revealed that many leg bones and rear torsos had been stripped of flesh but the toads heads were often ,not always, largely intact. The suggestion is that the large poison glands located just behind the toads head made this part unpalatable and hence not eaten. No other signs of otters or mink, spraint or fish remains, were found but the evidence of the dead toads was quite compelling for their presence even if only temporarily. 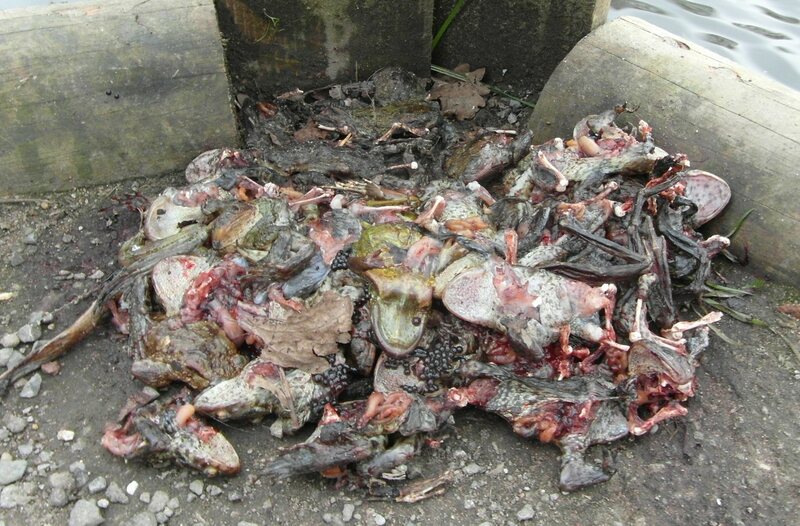 The toad deaths had stopped by the end of March. We estimate that about 250 had been killed in total. Some spawn did get laid in the pond, but not as much as we would normally expect. We will be keeping a close watch for similar events next year. We would be pleased to hear from anyone who has come across similar occurrences.